Description Pavilion-end Club the newest center of cultural & social events of Karachi located on Main Rashid Minhas Road. 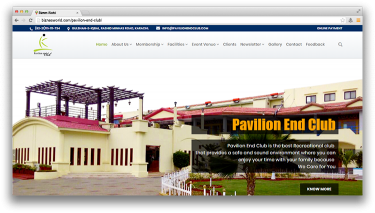 Pavilion-end Club is the brainchild of M/s. A. A. Joyland (Pvt.) Ltd, with their experience in this field; the Club has been designed keeping in view all the requirements of health conscious local residents. Address Gulshan-e-Iqbal Main Rashid Minhas Road, Karachi.